Russian foreign minister Sergey Lavrov has been speaking in front of the Parliamentary Assembly of the Council of Europe today, laying out Russia's visions for the European political and security architecture. The speech is pretty long and loaded with history*, but there are a number of important political points that come up in the last third. Lavrov repeats, directly and indirectly, what is the Russian position for years on what he calls "Greater Europe", a Europe that includes Russia and other non-EU member states of the Council of Europe as well as (some?) countries that are members of the OSCE. The Russian government wants that the Council of Europe takes on the "soft" issues into which he includes social and economic well-being, intercultural dialogue and a little bit of human rights. Like an intergovermental European Union light, just with Russia as a member state. And the OSCE should become the organisation that deals with hard, military security, replacing NATO and getting rid of the OSCE's elements that promote democracy and human rights. Since the other OSCE members are not happy about this, they have directed these discussions into the so-called "Corfu Process". In both organisations, Russia is trying to play down the roles of human rights and democratic freedoms. It is remarkable that in front of an organisation like the Council of Europe which has the European Convention on Human Rights as one its basic documents, Lavrov mentions the term "human rights" only three times (plus one time "rights") while stressing the issue of "security" 20 times throughout the speech. And he doesn't even mention once the European Court of Human Rights, which belongs to the Council of Europe and has more than once ruled on severe human rights violations in Russia. There are three particular quotes that caught my attention. "[W]hy do not we encourage in the context of the Corfu process all the OSCE members to adhere to the law of the Council of Europe?" This is a very strange proposal given that the OSCE countries that are not members of the Council of Europe are either definitely non-European (like the USA) or they clearly do not respect the values of the Council of Europe - human rights, democracy, and the rule of law - (like Belarus, the Central Asian countries, the Vatican). This proposal is thus pretty non-sense and seems to be a position that Russia just takes to counterbalance the rather hesitant position that the EU and the USA have on its proposals regarding the OSCE reform. Russia proposes to "outsource" the human issues away from the OSCE to strengthen its proposal to make the OSCE a pure hard security or defence organisation. "The proposals to diminish the mandate and competence of our Organization are inadmissible, as well as the attempts to limit its independence, transform the Council of Europe into a subsidiary body of the other European structures. The Strasburg Organization must be the leading European lawmaker in the proper sense of the word." "Owing to a more effective Council of Europe, our continent will have every chance to become truly integrated space with human rights promoted according to unified standards, where every citizen of the Greater Europe would benefit from real mobility realized in the free movement of ideas and people. It is quite hard to understand that the "visa iron curtain" is drawn, unlike during the Cold War, on the opposite side." In summary, the speech is in clear continuity of the Russian position with just some refinement and adaptation in the argumentation that reflect discussions in other fora - a sign that we won't see much development in the political landscape of the "Greater Europe" in the near future. * PS. 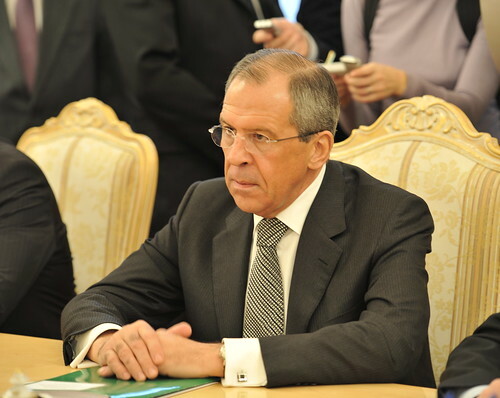 : Lavrov was reading really quickly - the poor translator... (see the video of the speech).